An explosion of McCabe CDs was under way in November/December 2003. The all-McCabe orchestral disc, recorded earlier in the year in Lithuania (see News Menu for an account of the recording sessions) has been released on Dutton Epoch CDLX 7133. 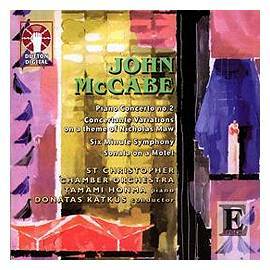 This contains Piano Concerto No 2, and three works for string orchestra: Concertante Variations on a theme of Nicholas Maw, Sonata on a Motet, and Six-minute Symphony. The music is performed by the splendid St Christopher Chamber Orchestra under conductor Donatas Katkus, with Tamami Honma as the magnificent and committed soloist in the concerto. The CD has already won high praise in Diapaison magazine in France. 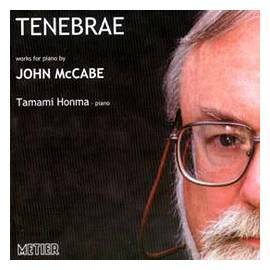 Tamami Honma has become closely associated with McCabe's piano music, and a second CD, released by Metier (MSV CD 92071), contains a wide range of his solo piano music including the première recording of perhaps his most important piano work Tenebrae (which gives the album its title). The disc also includes the première recording of a work written for Ms Honma, Scrunch (Omaggio a Domenico Scarlatti - Study No 8). A bonne bouche for Christmas: King's Singers Christmas, a superb CD of carols performed by the King's Singers on Signum SIGCD 502, containing another McCabe work, his carol To us in Bethlem city, another first recording. Two of his Mangan Triptych (Motet and Visions) are shortly to appear on a new CD from the William Byrd Singers of Manchester, conducted by Stephen Wilkinson, on the ASC label (ASC CD CD58).